I don’t know what the answer is to balancing the need for professionalism with the desire for people to be involved and the reality that if only archaeologists dug sites, most would never get dug…but these shows are certainly not it. I’d much rather see a show where professional and avocational archaeologists and community members all worked together to both dig and interpret sites, but I guess that wouldn’t fit with the current fascination with pawn shops, storage lockers, and antiquing, where one in a thousand items will net that lucky person with hundreds of thousands of dollars. The story that can be woven from one out-of-context item is engrossing, but it’s also inherently tied to it’s rarity and economic value in these shows.…Of course, doing the actual archaeology would take a lot longer than bulldozing a backyard for a cannon. le sigh. That sums it up pretty well, I think, it and echoes what I’ve been saying quite a bit lately—the media saturates us with “the past,” but generally does little to foster a real historical consciousness or understanding. One of my all-time favorite authors is the late Michael Crichton. Longtime dinosaur nut that I am, I’d probably find it hard not to be a fan of the man who brought Jurassic Park into the world, but it wasn’t until I’d been reading him for several years that I came to appreciate him as an intellectual force to be reckoned with. Here was a guy who had modern civilization’s number. One of his most overtly issue-driven books is Airframe, a story about an investigation into a commercial air disaster pitting an employee of a plane manufacturing company against an ambitious TV news producer. On one level, it’s a thriller; on another, it’s an indictment of the media in this so-called Information Age. At one point in the story, as the main character is about to be interviewed for a major investigative news program, her company dispatches a media expert to prep her for the experience. “A lot of people complain that television lacks focus,” the expert tells her. “But that’s the nature of the medium. Television’s not about information at all. Information is active, engaging. Television is passive. Information is disinterested, objective. Television is emotional. It’s entertainment.” The reporter who will be interviewing her “has absolutely no interest in you, or your company, or your airplanes.…He wants a media moment.” Crichton, of course, didn’t originate the practice of critiquing TV along these lines, but he made the case more powerfully and in a more articulate manner than most. Hence the way in which TV handles the past. The complex, detailed, and messy business of reality is not very congenial to the medium of television, but making sense of that reality is what historians, archaeologists, and scholars in related fields do. Their work requires the assimilation of lots of complicated information and a carefully constructed presentation of their findings. The issues with which working historians and archaeologists grapple—the need to determine what happened, why it happened, and what it all means—are not subject to the quick, neat solutions that characterize so many TV shows. The problems with which the characters on reality shows deal, by contrast, are generally pretty simple and straightforward. Some guy has brought an old musket into my pawn shop, and I need to know what it is and how much it’s worth. This is the stuff of “the past,” but it’s not really the stuff of history. Of course, there are exceptions to what I’m saying. I’m sure we could all come up with examples of solid and scholarly TV shows that make a real contribution to our understanding of the past. But those examples serve only to demonstrate the culpability of the media in general, because they show that the trifling nature of so much of our “historical” TV programming is not an inevitable result of the medium’s inherent limitations. As for those of us in the audience, it demonstrates our culpability, too, because the people in control of the lineup are ultimately just giving us more of what we already watch the most. We shouldn’t be too eager to blame the producers of culture for our predicaments, because culture is simply an expression of our collective appetites. The always-readable Jack Neely unravels the long, often ironic history of Tennessee’s presidential voting patterns. This state hasn’t always been red, although here in the eastern section Republicans have always been popular. Check it out. Coincidentally, the president of the Society for American Archaeology is protesting a similar show which is about to premiere on the National Geographic Channel, and has written a letter of complaint to the National Geographic Society’s CEO. Critics of this show have an online petition, too. Personally, I’m not opposed to relic hunting on principle, at least within reasonable limits. If somebody wants to take a metal detector and look for Minié balls or buttons on private land, that’s fine with me, as long as they have the landowner’s permission and the site isn’t particularly significant. When it comes to historically sensitive ground, that’s another matter. Battlefields, the sites of prison camps and hospitals, burial sites, and things of that sort are best left to the pros, even if the land in question belongs to private parties who don’t object to relic hunting. In archaeology, context is everything. Indeed, the information about an artifact’s context is as valuable as the artifact itself. Since the shows haven’t aired, I don’t know what sort of digging we’re dealing with. If we’re talking about sites and finds that merit a systematic approach, I’d rather see them left alone than get picked over by relic hunters, even if a full-scale excavation in the near future is unlikely. If this sounds snotty, let me point out that when it comes to archaeology, I’m not a professional, either. History and archaeology are two completely disciplines, with their own separate methodologies, programs of study, professional associations, publications, and so on. Historians and archaeologists draw frequently on one another’s expertise, of course, but even a terminal degree in history won’t prepare you to run a large-scale excavation. A few years ago, I got the chance to work with a professional team of archaeologists for a few days, when they came to campus to do some shovel tests for a survey of the area. It was fun and interesting, and I learned quite a bit, but by no means am I under the impression that I’m competent to interpret a site just because they showed me how to classify soil samples and screen for artifacts. If it turns out these shows are promoting irresponsible behavior, then I’ll add my voice to the chorus of protest. 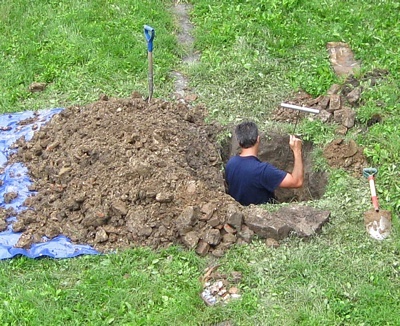 Until then, I’m going to wait and see what they’re digging up and where they’re doing it. The Teaneck school district is trying to unravel the embarrassing mystery of what happened to the heavy, flip-top wooden desk that sat for almost a half-century in the front office of the township’s high school. It was believed to have been used by the 16th president when he was an up-and-coming political figure in Illinois. No one can actually say when the desk disappeared; it could have been missing for six years or more. But a few months ago, a former school community relations official, Judy Distler, began asking about the desk. When no one seemed to know its whereabouts, she became worried. This is turning out to be a distressingly common problem here in the Volunteer State. Guys, next time you have to take down a historical marker for road work, put the darn thing back where you found it. Know somebody who’s made a worthwhile contribution to East Tennessee history? If so, consider nominating them for one of the East Tennessee Historical Society’s Awards of Excellence. They’ll be accepting applications until April 19. Click here for more details.